The psychic medium and me | What's a daddy for? It’s the first time I’ve come face to face with a self-proclaimed psychic medium. And I seem to be making quite an impression. As soon as she sees me she breaks out in goosebumps, she tells me there’s a lump in her throat. She seems temporarily overcome with emotion. She invites me to touch her hand. I touch her hand. It is cold and trembling. She invites me to touch her face. I touch her face. It is warm and flushed. In truth I’m not used to having this sort of effect on women. Several times in recent weeks I’ve written in this blog about how my life has gone in an unexpected direction. The truth, I now realise, is that the weirdness hadn’t even begun. I had expected some reaction when I posted last week about my first experience of a mindfulness class. But I hadn’t counted on the nature of the correspondence. People started to come to me with different ideas on how I could heal my mind. Really different ideas. Crystals. Lunar energy. Spiritual healing. Card reading. Mediumship. How the heck had I ended up here? The speed of this path disturbed me. I knew what I was getting into with mindfulness. I’d read Ruby Wax’s book. I understood the science behind it. The study of what role different parts of the brain play. Mindfulness is now offered as an approved medical practice for some conditions. I never believed it was a miracle cure. I don’t believe it’s for everyone. But I certainly thought it was worth a try. But card reading? Lunar energy? How could we travel from something which seemed rooted in logic to what I considered to be mumbo jumbo so quickly? What did it say about the world of alternative medicine that all these things get lumped in together so handily? And isn’t there a danger that vulnerable, depressed people get led so easily from something which has a proven physical benefit to some sort of mystical wasteland where their weaknesses can be taken advantage of? My mind has always been based in reason. I can’t believe in things which make no logical sense to me. I understand that there are millions of people who think differently. But I’ve always deeply resented the cynicism of professions and practices which exist to manipulate people’s innate need to believe in something outside of themselves. And so the idea was born. I’ve done a lot of unfamiliar stuff recently. Now I would go a step further and meet one of these spiritual healers. I would observe the process. Take part in it. I would make them aware of my doubts and put the rough questions to them. The game was on. An appointment was set up. 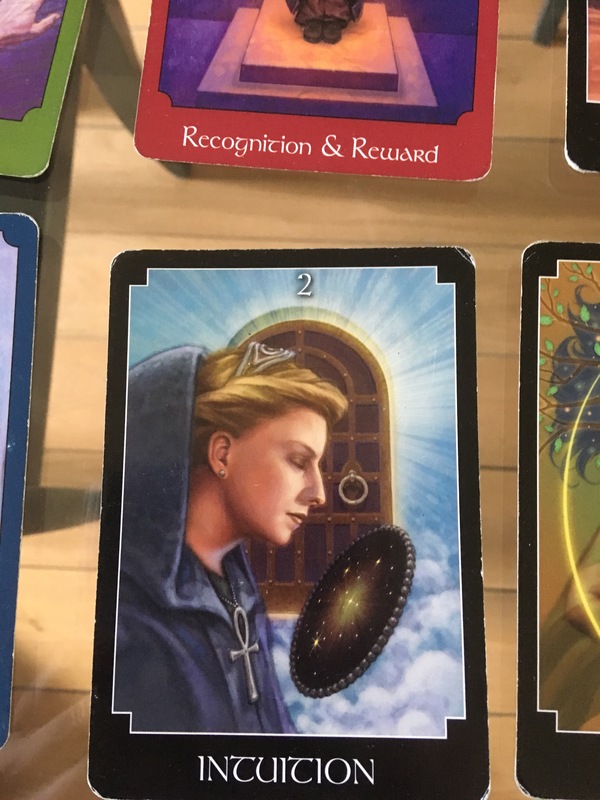 I was going to have my cards read. I hate to be unkind and I want to always give everything and everyone a fair hearing. 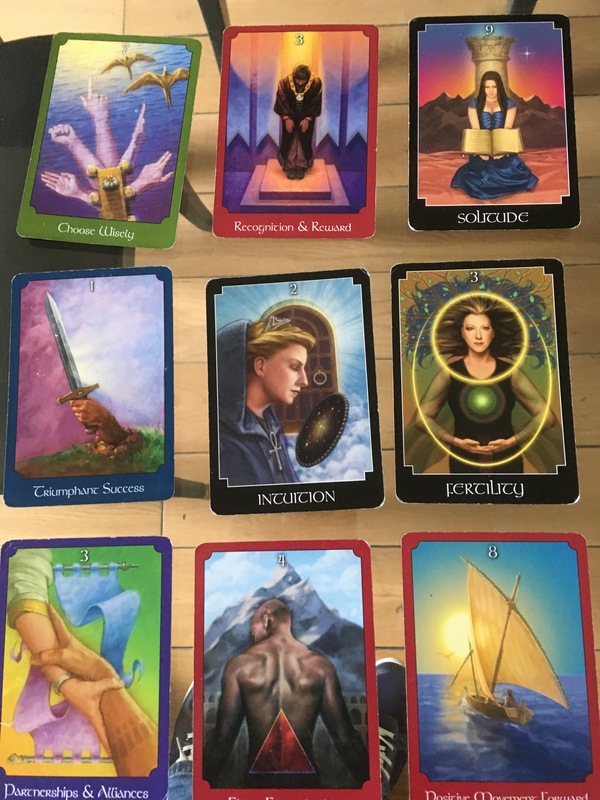 I tried to work out a logic for card reading in my mind. Perhaps it was just a glorified counselling session. The cards were simply a tool to unlock a conversation about difficult subjects. As long as there was no claim that outside forces were manipulating or controlling the process then we’d be ok. No voices from the other side please. I am introduced to a blonde haired woman. We start a conversation. A very long conversation. One that is still going on. But straight away she seems to be struck by the power of my aura. Sort of like Yoda when he meets Luke Skywalker. I want to be fair. I tell her I don’t believe in the process. I tell her I intend to write about it. She is calm and annoyingly nice. We discuss how it works. How she always knew that something was different about her from childhood. The feelings she would get. The scary words and pictures in her head that couldn’t be controlled. She says it was only when she left her career and trained as a medium that she found fulfilment. But I want to know where these mental pictures, these voices in her head, come from. Sharon tells me that we all have ‘guides’ in our lives. You can think of them as God, Angels spirits, whatever you will, but she sees herself as a channel to tell us what our guides are saying. But it goes further. She relates experience of passing on messages from dead people to their living relatives. In some cases she says that daily messages were passed to her from the dead to be given to loved ones. To me this is where something which could be explained away as harmless fun becomes dangerously manipulative. I tell her that if this is some kind of performance then it is the most cynical act in the world. She is utterly calm. Completely composed and solid in her conviction that she hears messages from the dead. She tells me to check the reviews on her website from clients who have been through this experience. They are glowing, of course. I ask Sharon what she knows about me. As a blogger I’ve put a lot of information about myself into the public domain. Information which could be used by a medium to provide a pretty good character profile for a reading. This appointment was set up by a third party. Sharon says she knows absolutely nothing about me. Not even my name. I start by observing her with another client. She dangles a crystal from the end of a chain. It moves back and forward. She tells me that it is energy causing this movement. The client is invited to ask three questions. If the crystal moves in a circle it means yes. Sideways means no. Or it might be the other way around. I can’t remember. I tell Sharon that she is manipulating the movement of the crystal with her hand and arm. She says she is not. Then it is time for my card reading. I refer to them as tarot cards but Sharon corrects me. Psychic oracle cards. She tells me that she gets different words and pictures in her head as she lifts each card. But these are all things which will be from my own mind, she is just channelling them. I shuffle the deck and she selects nine cards in sequence from the bottom of the deck. She lays them out on the table in three rows of three. The top row represents the past. Then the present. Then the future. The first card is marked Choose Wisely. It has a picture of what seems to be a man sitting on the edge of a pier staring out to sea. There are five arms protruding from the pier in different directions and two birds flying off into the distance. Clunky imagery. Sharon begins to physically struggle again. There are goosebumps on her arms (this happens a lot) and she complains of pains in her head and stomach. She looks genuinely distressed. Her hands begin to shake. She tells me that she knows that I have suffered a lot, she can feel that pain. It is flowing through her now. She talks of ‘men in suits’ and of me being made to do things I didn’t want to do. She throws out a lot of suggestions and asks if they mean anything to me. I try to respond as little as possible. Then she says something very specific. She says her throat is contracting and she feels I may have had trouble eating food at some point in my life. Last week I posted a blog about my difficult relationship with food. I talked about the trouble I sometimes had swallowing. I look directly at Sharon. I ask her again if she has read anything about me. Again she insists she doesn’t know me. She shows me a text sent to her setting up the appointment which refers only to a ‘man’. Later I ask the person who set up the appointment and she also insists she did not reveal that I was to be the subject. The central card of the nine is apparently the most significant. In my case it is Intuition. It seems to be a monk wearing a tiara in front of a floating door staring longingly at some sort of black disc. Actually it might be an Oreo biscuit. I often stare at biscuits like that. The centrality of the Intuition card represents how tuned I am to other people. Part of my suffering is my sensitivity towards other peoples’ pain, Sharon tells me. I can judge characters shrewdly. I have a strong aura. Latent powers that I am not yet aware of. Indeed it seems that I might actually possess the gift. Sharon is confident in my abilities. Much more so than myself. She smiles as she tells me how she used to be a sceptic, just like me. She tells me that in a few years I’ll be in an entirely different place. Which brings us to the future. The final card is Positive Movement Forward. It shows someone sailing off across the ocean towards a setting sun in a tiny little boat. Not unlike Iggle Piggle from In The Night Garden. Sharon tells me that I have changed the direction of my life. I have already started to take the right steps. Everything is going to work out. I don’t need to worry about finances. There will be a big announcement about my future in the coming weeks. She says there is a word which keeps flashing across her mind. Contentment. And then Sharon looks at me. A shy smile on her lips. Almost childlike. She wants to know if I’m happy with the reading. Does it make sense to me? Undoubtedly it does. Many parts of it seem to be describing my own life. The struggles and pain. The decision to change my life. The hopes for a new future. It’s all me. But then it’s probably a lot of other people as well. Generalisations which appeal to many. She has painted a pretty picture. A simple tale with a happy ending, designed to make the client feel better about themselves. Emotions always work better than facts. I put this to Sharon. I tell her that this narrative will be consistent for many of the people who visit a psychic medium. Of course it is going to be people who are broken, people who are seeking a new direction. People who need something outside of themselves to make sense of life. But, as ever, she is unbowed, insisting that she felt my individual pain. Pointing out that she referred to a couple of things which were very specific. I have to concede this is true. I continue to ask her questions. For several hours. Late into the night. My interrogation is more thorough than any I’ve ever carried out in my journalistic career. She takes the time to answer every question. Some of the responses and the logic are woolly but they keep coming. There’s something specific I’m seeking here. A truth I’m desperately trying to get at. I know I’ll never believe in what Sharon does. I’ve come along and witnessed it. I’ve seen nothing to alter my view. But I know there are millions of people who do believe. Who get comfort and solace from it. I’ve no interest in trying to change anyone’s mind. What I’m really trying to unearth is does Sharon believe it? Behind the smiling face and mellifluous voice, in the crystallisation of her heart, does she honestly think what she is doing is real? Because I suppose that’s the point. The difference between a person who is, in her own mind, genuinely trying to help people and the worst kind of fraud. I ask the question again and again. Finding different ways to frame it. I ask it to her face. I send messages later. It always comes back the same. I don’t profess to have any special wisdom or understanding of how other people behave or project themselves. I know I’m untrained in the techniques, tricks and methods that so-called psychic mediums use to unlock our secrets. But as a layman I form my view. Using the same techniques and defences I would in meeting any new person in any situation, Sharon comes across to me as someone who believes what she does is genuine. But it’s even worse than that. I find that I actually like her. She is clearly devoted to her family. She’s a mother and loves to talk about her children. Just like I do. She has battled mental health difficulties. Just like I have. She is open, warm and caring. She thinks about the needs of others. The sort of person I imagine I could be friends with. There’s a part of me which now regrets starting this endeavour. Because I know it inevitably ends with me composing a sceptical article. And I find myself thinking that I don’t want to write something which hurts her. But the problem won’t go away. She claims that she gets messages from the dead relatives of some of her clients. An act that every part of my understanding of life tells me is wrong, tells me is the worst form of exploitation. I don’t know how to flatten this stone. It’s a contradiction that just won’t go away. I’ve started a conversation that will go on and on. Sharon looks at me. The goosebumps are on her arms again.